The acronym, which they pronounce “boy-fah” and invoke daily, stands for “Be where your feet are.” It is the oft-repeated slogan of Linda Lee Jackson, O.P., a campus minister at the University of Dayton, in Ohio, and a call to live in the moment. It is one of many ways Sister Linda Lee has proved surprisingly relevant to Clifford, a busy college student who sometimes struggles to attune her head to the whereabouts of her feet. “So often we are glued to our phones,” Clifford acknowledged. The two women recently enjoyed a weekend of bonding as participants in the kickoff of National Catholic Sisters Week, connected to National Women’s History Month and celebrated during the second week of March each year. Nearly 60 sister-student pairs from more than 50 colleges and religious congregations gathered at St. Catherine University in St. Paul, Minn., from March 7 to 9 to help launch the ambitious three-year program funded by the Conrad N. Hilton Foundation. The campaign is intended to elevate women religious and connect them to young women. Ultimately, the hope is to open up more Catholic women to the possibility of religious life. How to go about that—the church’s million-dollar question—is not a matter of a slickly produced marketing campaign, insist the co-directors of N.C.S.W., but of presenting a stripped down, heartfelt narrative. That is exactly what took center stage during the kickoff gathering of the initiative, when four sisters shared turning points in their path to consecrated life using the quirky storytelling style of The Moth Radio Hour, the National Public Radio show that won a Peabody Award in 2010. Perhaps the promotion of religious life is more “Charlie Rose” than “Mad Money”—fewer blinking billboards, slower cuts. The young women in the audience seemed gripped by the uninterrupted tale of Carolyn Martin, I.S.P., who was fitted for her postulant outfit decades ago as she glanced out the window at her boyfriend, waiting in the car and unprepared for their imminent breakup. And college students polled about a name and icon for N.C.S.W. expressed preferences for the “simple” and “plain,” turning down a bright, boxy design that felt too busy. Harnessing the Internet is a powerful way to spark real-life friendships, even if 140-character messages on Twitter feel superficial—an objection raised by a sister during social-media training. The women religious were advised to be personal in their online outreach, which begins by replacing the egg that automatically appears as a person’s Twitter avatar with a real photo. “I have to remove my egg!” Sister Linda Lee said afterwards. Honorata Grzeszczuk, C.S.S.F., attended the same session, wearing a habit and tapping notes into her Nexus tablet. “I learned more about the power of social media and the need for our presence there. I mean open presence, not one holy corner in the Internet, but an active presence,” she said. Sister Julie soon experienced the “circle of sisterhood,” a sense of spiritual camaraderie that washed over her during a Come and See weekend, a retreat for people who want to learn more about life in a particular religious congregation. She felt it again during the N.C.S.W. kickoff. “There was an overwhelming sense of sisterhood that transcended age, culture and geography and whether the participant was a student or sister,” she said. When asked about their N.C.S.W. sister, many students used the word love. She and Sister Linda Lee had just posed for a photo taken with an iPad. “My daughter from another mother,” Sister Linda Lee had joked, pulling in Clifford, 44 years her junior, for a cheek-to-cheek hug. “I admire how she sees the good in people,” Clifford later said. “She tells you what you’re good at.” And Clifford knows that Sister Linda Lee sees great potential in her as a sister. “I’m discerning,” she said. The Catholic Volunteer Network is now setting out to explore the link between volunteer programs and religious life, creating more opportunities to volunteer with a religious congregation and measuring the impact of relationships with sisters on young women considering a vocation. The undertaking is being funded by a new grant from the Conrad N. Hilton Foundation, piggybacking on the work of its related grants, including National Catholic Sisters Week. Nearly half of the women who made final vows last year say they were personally encouraged to consider a vocation by a religious sister or brother, according to a CARA study. Parents, parishioners and relatives were reportedly much more likely to encourage men to pursue religious life than women, whereas friends were nearly five times as likely to encourage women as men. Some of those encouraging friendships began at the N.C.S.W. weekend, where young women cemented nascent bonds by friending each other on Facebook. “They found such peer support among other young women who also have this hunger to learn more about sisters,” said Sister Mary Soher, the co-director. Moving forward, all the students are invited to create oral histories of women religious, settle into one-on-one relationships and share their finished videos on SisterStory.org, a digital hub for National Catholic Sisters Week. 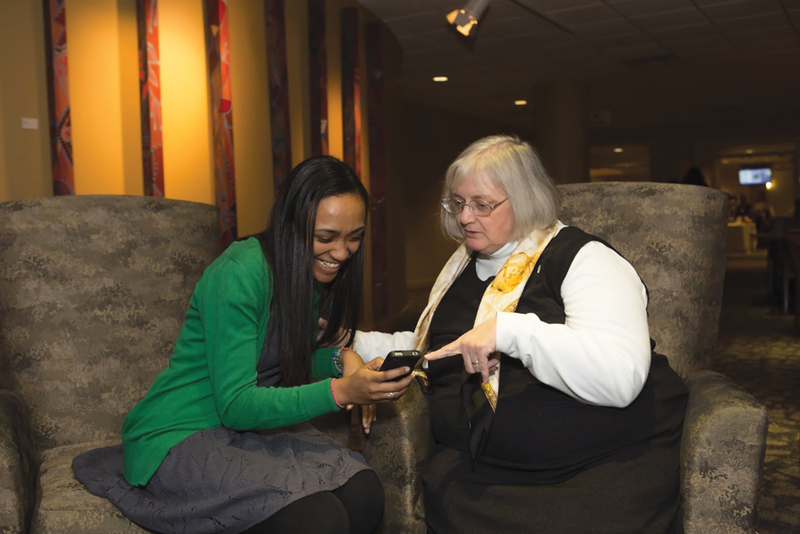 Sister Mary asks young women and women religious to check the website in the coming months as she and her colleagues tweak the oral-history pilot program and begin rolling it out at other colleges. She hopes to continue the momentum from the inaugural N.C.S.W. by engaging with a broader audience online and looking into regional meetings in 2015. Clifford, for her part, intends to bring more women religious to campus so her peers can benefit from their wisdom, as she has. After taking off from Minneapolis and landing at the airport in Dayton, Ohio, she and Sister Linda Lee discussed their plans during a pancake supper at Cracker Barrel. “We both love breakfast food!” Clifford said. This article also appeared in print, under the headline "Celebrating Sisters," in the April 14, 2014 issue. Christina Capecchi, a freelance writer from Inver Grove Heights, Minn., is the author of the nationally syndicated Catholic column Twenty Something.